The Māori word for this place is turangawaewae, which means place where I stand, and its majestic, near-perfect peak gazes down at you wherever you go. The geographic and spiritual heart of this slice of heaven is the eponymous (and dormant) volcano. Can you name it? We're talking about Mount Taranaki, of course, and our last trip here was so incredible, we’re making a return visit. The Kiwis of Taranaki are incredibly proud of their homeland and love living in the lush region. It's a place that boasts a mild climate, plenty of sunshine and abundant rainfall—making it luxuriously green. The surf’s up here, too. 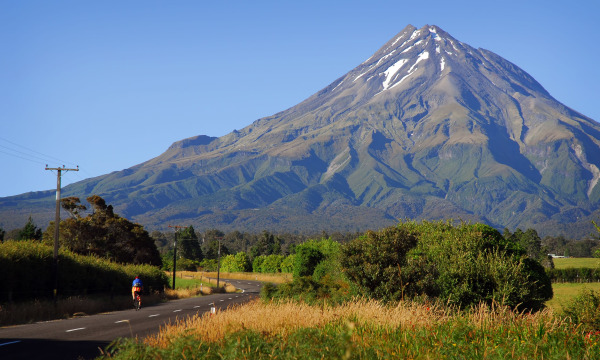 Outdoor adventurists from all over the world head to Taranaki to ski or board, then ride the classic waves along Surf Highway 45. As a matter of fact, Taranaki is one of the few places on earth where you can ski in the morning and surf in the afternoon.